Digga Europe Machinery Attachments: Anchor drives - 2 Speed High Powered 45000nm-94000nm. Our 2 speed drives for excavators suit machines with flows up to 380 lpm, providing you the speed and performance without having to detune your machine. Precision machined in-house from high grade alloy steel, specially formulated for gear manufacturing. A highly efficient, pressurised gearbox to ensure no leaks & minimal maintenance. Ensures maximum volumetric effeciency for consistent & efficient application throughout the working day. This revolutionary bypass valve is fitted to the drive to control the rapid decompression of oil should it be used for screw anchor application. For maximum strength. Specifically designed for heavy duty drilling applications. 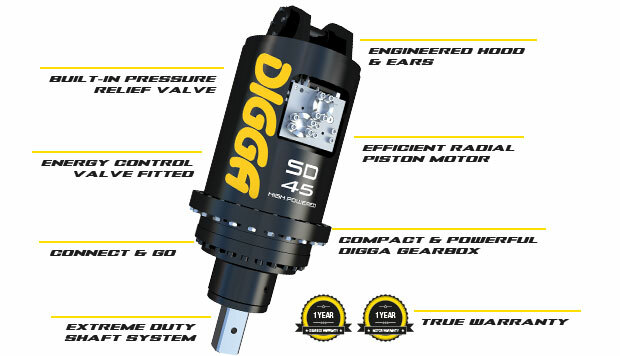 The Digga 2 piece shaft, is a separate component to the planetary carrier, isolating the planetary gears from the pushing, pulling, and bending forces generated by the machine.